Arron Services can provide Domain name registration and E mail setup & configuration, Low Cost Business Phone (VoIP) Services and Online Backup Services. Arron Services can provide Domain name registration and E mail setup & configuration, however we do not offer any in house Web Design services however we do partner with a local web development agency and would be happy to arrange an introduction. 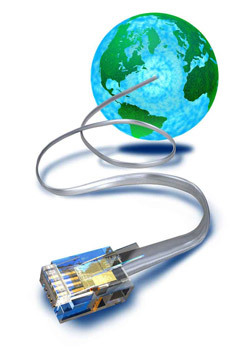 Calls route through the internet and you can use your office telephones, PCs or mobiles. Quick and easy, wherever you are working. Have your voicemails & faxes sent to your email inbox to get a single view of your messages. It's easy to forward a message to a team member, too. Our VoIP provider will charge a flat monthly fee for business VoIP services, including your features. Save on line rental by putting calls on a normal broadband line. Choose from several minutes options. - As many phone numbers as you need! Keep your business telephone number, get a new number or add regional numbers (UK-based or international). Give your business a larger presence and stay in touch. Update your call settings, adjust call routing, check voicemails and review your bills 24/7 through a secure portal. Our VoIP provider offer UK based customer support 8am to 8pm. We are featuring our off site backup solution as the answer to data security and integrity. Just think! What would happen to your business in the event of. The results could be disastrous. For what amounts to a small monthly charge, we provide peace of mind so if a disaster should occur, you can retrieve all your data from your cloud backup. We also provide full disaster recovery from just advice to full implementation. Our internet service can provide you with domain name registration, email setup and configuration and broadband services. Here at Arron Services we also offer an online backup service or full disaster recovery so that if the worst should happen, you know your data is covered.